Lea Hogg with Vivek Singh. It is not easy to achieve the right balance when mixing spices for Indian dishes. 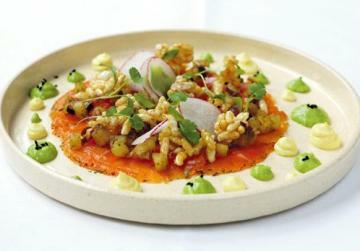 This week’s recipes mark a visit to Malta by Vivek Singh from The Cinnamon Club in London. 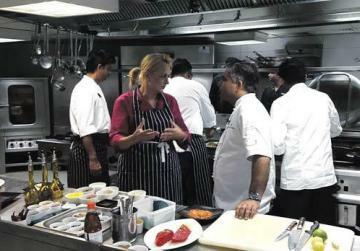 It was a wonderful experience to share his kitchen and work with him. 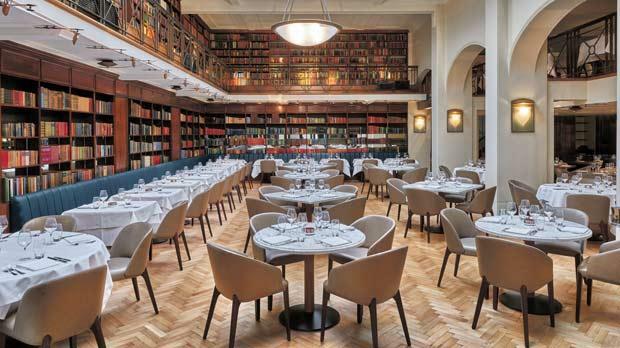 Vivek’s style of modern Indian cooking uses the freshest ingredients cooked to perfection. The kitchen counter was stacked with vibrant aromatic spices and each plate was a work of art. Singh is one of today’s great British chefs and the author of several cookbooks. He has adapted these recipes for home cooking. Although the combination of ingredients is imaginative, his recipes are easy to prepare and the spices I include on these pages are available locally. You can watch some of Singh’s work during his visit to Malta on the progamme Lifestyle on TVM2 this week. Mix together all the spices and coat the fillets, cover and leave for eight hours. After eight hours turn the fillets, coat them again and leave for another eight hours. Repeat process. After 24 hours, remove the excess spices and salt and, if required, wash the fillets. Dry and evenly sprinkle two tablespoons dill, two tablespoons coriander, 1 tablespoon red chilli powder, ¼ teaspoon cumin seeds and ¼ teaspoon mustard seeds. 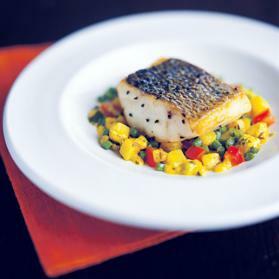 Thinly slice the fillets and arrange on a plate. Serve garnished with lime segments. For the green pea relish, mix together the peas with ginger, garlic, green chillies, salt, sugar and one tablespoon mustard oil in an electric blender to make a fine purée. Heat the remaining mustard oil in a pan, add the mustard seeds and curry leaves, allow it to crackle, take it off the fire and pour it over the puréed green pea mixture. Check the seasoning and finish with lime juice. Mango comes from both India and Pakistan and although not cultivated locally, it is found in almost every vegetable shop. Squeeze the juices of the mango and use a food processor to turn it into a smooth purée. 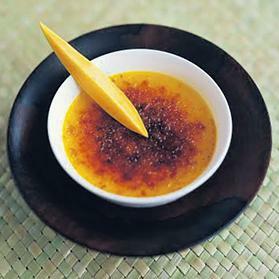 Put the cream, sugar, ground green cardamom and mango purée in a pan and bring to boiling point, stirring occasionally. Whisk the egg and egg yolks together in a bowl and slowly pour in the mango mixture, whisking constantly. Pour the mixture into six ramekins and place in a roasting tin half full of hot water. Bake in an oven preheated to 120˚C for 30 minutes or until just set. Remove from the roasting tin, leave to cool and chill. Sprinkle the sugar on top and caramelise with a blowtorch or under a hot grill. Allow the top to crisp and serve. Score and marinate the aubergines with oil, salt, red chilli powder, turmeric and cardamom seeds, onion seeds, fennel seeds and salt. Set aside for three to four minutes. In the meantime, combine all the ingredients for the spice crust. Use a pestle and mortar to make a coarse powder. Spread the mixture on a tray and allow to dry. 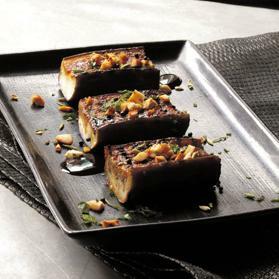 Place the flat side of the aubergine on a hot grill or pan and sear for two minutes. Repeat on the other side. Brush with oil and cook for three minutes or until the aubergines cook through. Place them on a plate flat side up, apply a dash of tamarind chutney, sprinkle the spice mix and serve hot with green salad. Pat dry the fish fillets on a kitchen paper, rub in all the ingredients except the oil. To make the sauce heat the oil in a heavy-based pan, add the onions and sauté until golden brown. Add the turmeric powder, ginger and chillies and stir in the cashew paste and cook on low heat, stirring constantly for 4-5 minutes. Add the yogurt and cook over a moderate heat for two minutes. Add the fish stock and cook for three more minutes. Add the ginger, salt and sugar and adjust seasoning. Stir in the lemon juice and fenugreek leaves, set aside and keep warm. For the potato stir-fry, heat the oil in a heavy pan, add the cumin and let it crackle. Add the potatoes, salt and turmeric and sprinkle with one tablespoon water. Cover with a lid and allow it to steam and cook for 3-4 minutes. Remove the lid, stir the potatoes in the pan and add the beans. Cook for another 4-5 minutes until the potatoes get cooked but the beans do not discolour. Set aside. For the fish, heat the oil on a large Teflon-coated frying pan, place the fish fillets skin side down and cook on low heat for about two minutes on each side. Divide the potato stir-fry on four plates. Pour the sauce next to the stir-fry; place the fish on top and serve with steamed rice. Cook the fish skin side down on the pan and let it cook without necessarily moving it too much to get a crisp skin. You will see the fleshy side turning slightly opaque – a sign that the skin is nice and crisp. When you see this, just turn the fillet over and take the pan off the fire; the heat will cook the fish off perfectly. • Exercise and keep active. For more cholesterol-lowering hints, tips and recipe ideas visit www.floraproactiv.co.uk. Flora Pro.Activ is part of a portfolio of Unilever brands imported and distributed locally by M&Z (Marketing) Ltd. For more information, visit www.mz.com.mt or http://facebook/mzmltd . Meanwhile, you can try the following recipe using Flora Pro.Activ. Halve the aubergines lengthways and scoop out most of the flesh leaving a 1cm shell. Arrange on an oiled baking sheet with the pepper and sprinkle with one teaspoon of oil. Roast in a preheated oven at 180°C/gas mark 4 for 30 minutes. Heat the remaining oil and sauté the onion and garlic until soft, then add the tomatoes, cinnamon and sugar. Season with pepper and simmer until reduced by half. 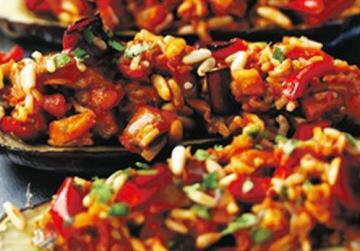 Chop the aubergine flesh and add to sauce with coriander and pine nuts and cook for a further 10 minutes. Stuff into the aubergine shells with tomato mix and serve.